Our new special exhibition Gladiators: Heroes Of The Colosseum opens for members tomorrow, March 10th and to the public on Monday, March 13th! In preparation for the opening of the exhibit, we’ve been doing tons of research on ideas to blog about, and today we will present some of the most unexpected facts uncovered during our hours of study. 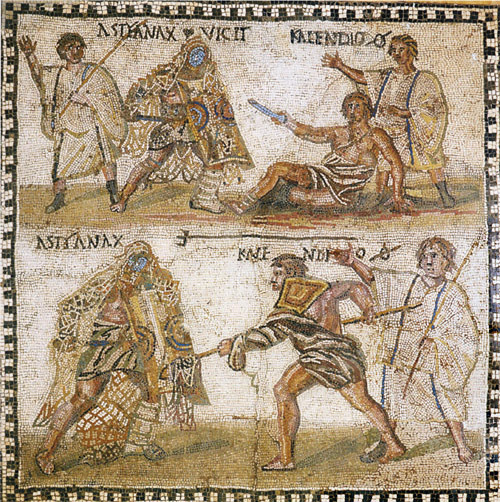 Gladiators from the Zilten Mosaic. Image courtesy of Wikimedia Commons. Gladiatorial combat began in Rome as a funeral ritual. There is a lot of speculation about where the concept of gladiatorial sport comes from and when exactly it started. According to ancient Roman historians, the first Roman gladiator fight was held at the funeral of Junius Brutus Pera in 264 BC. Three pairs of slaves are reported to have fought to the death at the event. It was sponsored by the deceased’s two sons, in honor of their father. In the ensuing centuries it became popular for prominent men to give munera, or spectacles designed as offerings to honor a deceased relative. Besides honoring the dearly departed, the events also allowed the editors, or sponsors of the event, to gain popularity and recognition among the populace. Over time munera became important tools for social advancement, it was not unusual for a person running for public office to suddenly decide to honor a long-dead relative by providing free spectacles to the local populace for a few days, including exotic animal hunts and gladiatorial combat. Over time, these spectacles lost their association with funerals, and became customary public events, especially after Rome became an Empire. Most people think of gladiators as men, and the vast majority were. However female gladiators, or gladiatrices, did exist. Unfortunately female gladiators did not share in the same glory of their male counterparts. Even though gladiators were slaves and belonged to the lowest ranks of society, successful male gladiators could hold great prestige and make a lot of money. This was because male gladiators represented the martial strength and bravery that were central to the ideal Roman male identity. In addition to that, some historians suggest that in an age before television, gladiatorial combat was the closest many urban Romans could get to witnessing Rome’s glorious conquests abroad. This would have been especially true in earlier periods when gladiators were often dressed in armor styled after enemies of Rome, such as the Thracians or Samnites. So male gladiators were a conduit for all of the patriotism and adrenaline of a populous that lived far away from all glorious conquests of their empire. Their adoring fans would shower successful male gladiators with presents, and some received a part of the profits made by their owners. Female gladiators on the other hand did not represent the Roman ideal of womanhood. The average Roman citizen could see no moral value in a woman fighting for her life in order to entertain a crowd, so female gladiators were not held in high regard. There are very few accounts of female gladiators in existence today and most historians assume that the spectacle was a rare novelty. There were different “types” of gladiators: the Thraex, the Provocutor, the Hoplomachus, the Murmillo, the Secutor, the notorious Retiarious, and many others depending on the time period and location. Each type had a specific style of armor and specific weapon or set of weapons they would use. To make things more entertaining, the heavily armored categories of gladiators would usually be paired against lightly armed but more agile opponents in the arena. Gladiators trained rigorously in preparation for games. Muscle memory plays an important role when fighting with swords and other handheld weapons, so moves were choreographed and practiced intensely during training. Gladiatorial combat has been said to more closely resemble a ballet than a bar fight. During training, the assumption was that you would be going against a right-handed opponent, so the choreography would be designed with that in mind. Therefore, a left-handed gladiator would have a decided advantage over his opponent. This is just a small sample of all the amazing gladiator facts waiting to be uncovered at our new special exhibition Gladiators: Heroes Of The Colosseum. Don’t miss it!